A group of adult women and men gathers at Shadyside Presbyterian Church on Tuesday evenings to study the Scriptures together. Interested church members, friends, guests, and neighbors all are welcome and invited to join us. Beginning Tuesday, October 9, 2018, we will study Good News for All: The Gospel of Luke, published by the Kerygma Program. We will meet at the church on Tuesdays from 7:00 to 8:30 p.m. 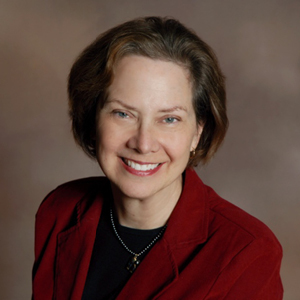 Facilitated by Elder Peggy Heely, this fourteen-week study will meet for seven weeks this fall (beginning October 9) leading into Advent, and then for seven weeks after Christmas (resuming January 15), leading into Lent. Kerygma materials are written from a Reformed perspective. Their focus is on the biblical book or passage, and providing good scholarly background and contextual information for each participant to read in advance of the group discussion. No lectures, no quizzes. Just good discussion and interaction with these very rich biblical texts. If you are interested in attending, please contact the church office so that we can order a resource book for you (cost: $17). Why are we studying Luke? While each New Testament author contributes to our picture and understanding of Jesus, Luke shows us a savior who reaches around the world, who breaks the bonds of race and nation. In addition, the Gospel of Luke is the featured gospel for Lectionary Year C, which begins with the season of Advent on Sunday, December 2, 2018. Luke also devoted a significant portion of his gospel to Jesus’ ministry in Jerusalem and the time leading up to the events that are our focus during Lent and Holy Week. So, Luke’s is a wonderful gospel to study around the seasons of Advent and Lent. Architectural Photograph: Detail of a carving on the lectern in the Chancel of the Shadyside Presbyterian Church Sanctuary. Design by Charles Marcus Osborn, 1938. 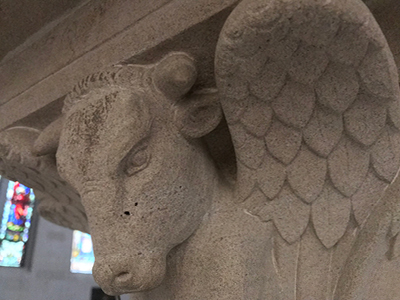 Carved symbols representing the four evangelists adorn the lectern; the winged ox is the symbol frequently used in art to represent St. Luke.